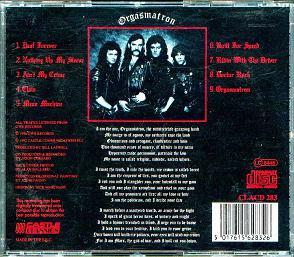 The line-up that recorded Orgasmatron in 1986, Lemmy, Wurzel, Phil and Pete, had existed since 1984. In 1984 they decided they wanted to leave Bronze which resulted in a lot of juridical and financial problems. During these years they toured and at last in 1986 they could sign a new deal with their managers´ Douglas Smith new label GWR (Great Western Road, the home address of Douglas office). 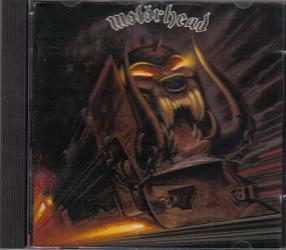 The producer was a really interesting, and for Motorhead many thought very unusual, choice, Bill Laswell. Bill had previously worked with, amongst others, PIL and Mick Jagger. 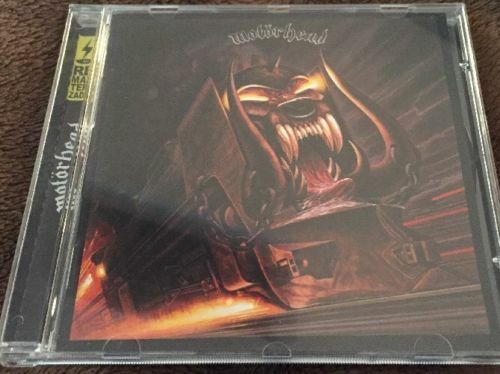 In retrospect Lemmy has said it was a mistake: “Bill was good for getting sounds, but he fucked everything up in the mix. 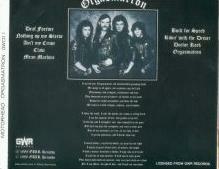 It was a much better album when he took it to New York than when he brought it back” (WLF p 195). 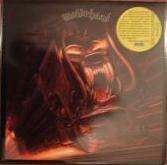 The recording was done at Master Rock studios in London in March and only took 11 days (WLF p 194). 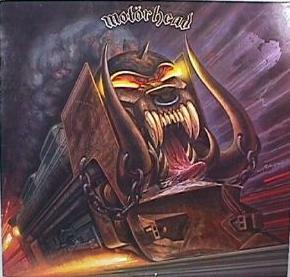 Initially the album was intended to be called “Riding with the Driver” after one of the tracks, but that track did not turn out as good as they had hoped for. In the last minute it was changed to Orgasmatron. There were apparently also times when “Mean Machine” and “Built For Speed” were discussed as possible titles. 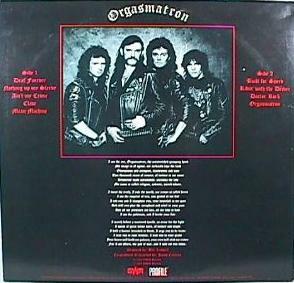 The lyrics to Orgasmatron was something that Lemmy wrote "in my sleep" at four o´clock in the morning in a hotel room. He claims he doesn´t remember anything about it the day after, he just found a note with the lyrics that he had scribbled down. The song is also the only song that he ever has tried to sing but he gave it up eventually. 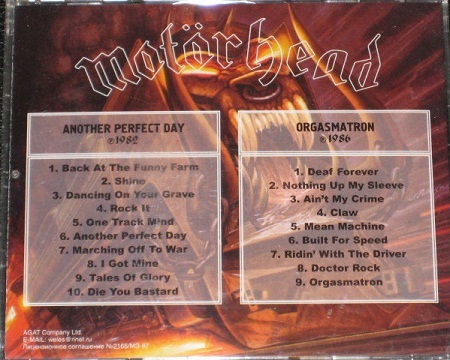 Another song that was written very early in the morning when he was pissed (look at the Birtday Party video) is "On the Road" that later was re-written and re-named "Built For Speed". The cover is one of Joe Petagnos´ most admired works. The album was really well received by the press but sales wise it was quite modest. 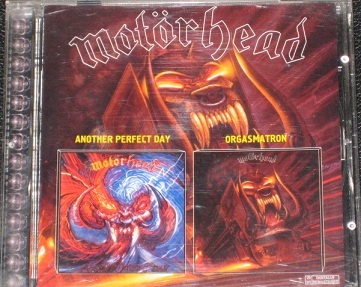 According to Lemmy the low sales numbers were partly because GWR had bad distribution deals. In 2004 Classic Rock Magazine included it in a list of forgotten classics. 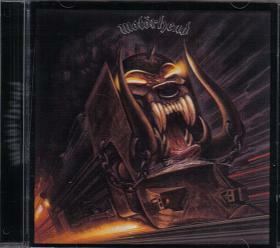 It was the first Motorhead album that also got released on CD. Some of the songs had already been played live. 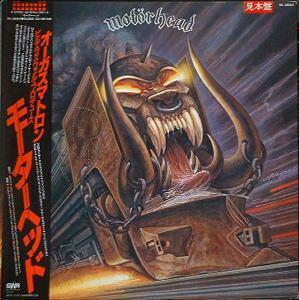 “Built For Speed”, “Nothing Up My Sleeve” and “Mean Machine” were all included in the live set in 1985 and in December the same year all the nine songs that ended up on the album were written. CGD Messagerie GW 20538 Italy 1986-08-09? Festival L 38642 Aus 1986-08-09? Festival L 38642 NZ 1986-08-09? Interfusion L 38642 NZ 1986-08-09? Polarvox GWLP 1 Fin 1986-08-09? Viper VRP 117 Can 1986-08-09? Victoria VLP 218 Spa 1986-08-09? Helidon 7 551467 Yug 1986-08-09? Rock Brigade RBR 040/87 Bra 1986-08-09? Profile PAD 1223 USA 1986? Attic ACDM 1356 Can 1990? Festival D 38642 Aus 1992?